For other people named Richard Lee, see Richard Lee (disambiguation). A painting of Lee at the National Portrait Gallery in Washington, D.C.
Richard Henry Lee (January 20, 1732 – June 19, 1794) was an American statesman and Founding Father from Virginia best known for the Lee Resolution, the motion in the Second Continental Congress calling for the colonies' independence from Great Britain. He was a signatory to the Articles of Confederation, and his "resolution for independency" of June 1776 led to the United States Declaration of Independence, which Lee signed. He also served a one-year term as the President of the Congress of the Confederation, and was a United States Senator from Virginia from 1789 to 1792, serving during part of that time as the second President pro tempore of the upper house. He was a member of the Lee family, a historically influential family in Virginia politics. He was born in Westmoreland County, Virginia to Col. Thomas Lee and Hannah Harrison Ludwell Lee on January 20, 1732. He was raised and came from a line of military officers, diplomats, and legislators. His father, Thomas Lee, was the governor of Virginia before his death in 1750. Lee spent most of his early life in Stratford, Virginia with his family at Stratford Hall. Here he was tutored and taught in a variety of skills, and witnessed the very beginning of political career as his father sent him around to neighboring planters with the intention for Lee to become associated with neighboring men of like prominence. In 1748, at 16, Lee left Virginia for Yorkshire, England, to complete his formal education at Queen Elizabeth Grammar School, Wakefield. Both of his parents died in 1750 and, in 1753, after touring Europe, he returned to Virginia to help his brothers settle the estate his parents had left behind. In 1757, Lee was appointed justice of the peace in Westmoreland County. In 1758 he was elected to the Virginia House of Burgesses, where he met Patrick Henry. An early advocate of independence, Lee became one of the first to create Committees of Correspondence among the many independence-minded Americans in the various colonies. In 1766, almost ten years before the American Revolutionary War, Lee is credited with having authored the Westmoreland Resolution which was publicly signed by prominent landowners who met at Leedstown, Westmoreland County, Virginia on February 27, 1766. This resolution was signed by four brothers of George Washington as well as Gilbert Campbell. Lee had returned to Virginia by the time Congress voted on and adopted the Declaration of Independence, but he signed the document when he returned to Congress. Lee was elected the sixth President of Congress under the Articles of Confederation on November 30, 1784, in the French Arms Tavern, Trenton, New Jersey. On January 11, 1785, Congress convened in the old New York City Hall and Lee presided over that Congress until November 23, 1785. Although, he was not paid a salary for his office as president, his household expenses were paid by Congress in the amount of $12,203.13. I hope we shall shortly finish our plan for disposing of the western Lands to discharge the oppressive public debt created by the war & I think that if this source of revenue be rightly managed, that these republics may soon be discharged from that state of oppression and distress that an indebted people must invariably feel. The states relinquished their right to this "test tract" of land, and the Land Ordinance of 1785 was passed on May 20, 1785. The federal government, however, lacked the resources to manage the newly surveyed lands because Native Americans refused to relinquish a large percentage of the platted land, and most of the territory remained too dangerous for settlement. This either required troops to eject the Native Americans or capital to purchase their land "fairly", insuring the peaceful sale and settlement. Additionally the small amount of federal land that was not in dispute by the Native Americans was enthusiastically being occupied by western settlers that had no faith in or respect for the Congress as a federal authority. The settlers claimed the land as squatters, and the Congress was unable to muster the capital to send magistrates let alone troops to enforce the $1.00 per acre fee required for a clear federal land title. With the states no longer in control of the lands and no federal magistrates or troops to enforce the laws, a tide of western squatters flowed into the Northwest Territory. 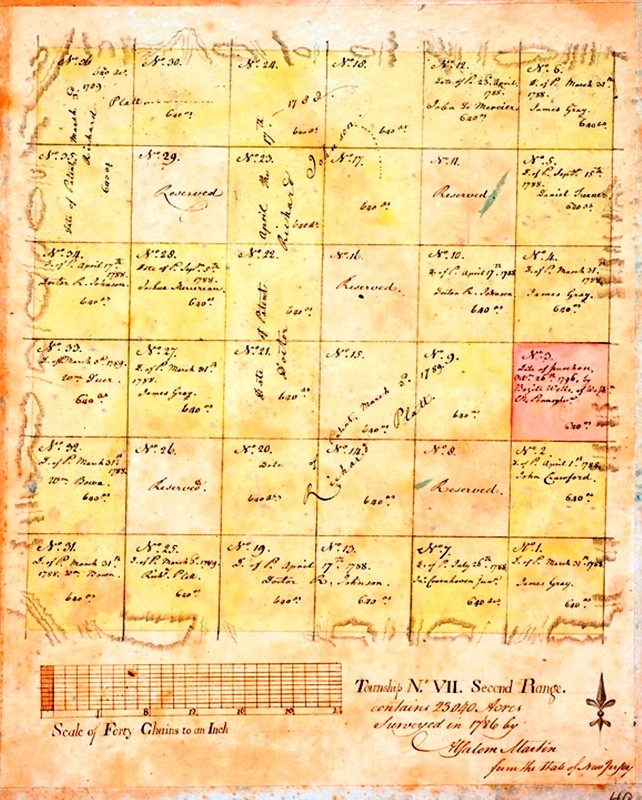 Lee's plan to fill the federal treasury with the proceeds of land sales failed, but the survey system developed under the Land Ordinance of 1785 is still used today. Lee was the son of Col. Thomas Lee, Hon. (1690–1750) of "Stratford Hall", Westmoreland Co., Virginia. Thomas married Hannah Harrison Ludwell (1701–1750). Lee married first on December 5, 1757, Anne Aylett (1738–1768), daughter of William Aylett and Elizabeth Eskridge (1719). Anne died December 12, 1768 at Chantille, Westmoreland Co., Virginia. The couple had six children, four of whom survived infancy. Lee remarried in June or July 1769 to Anne (Gaskins) Pinckard. The couple had seven children, five of whom survived infancy. Lee honored his brother, Francis Lightfoot Lee (another signer of the Articles of Confederation and the Declaration of Independence), by naming his fourth son after him. Richard Henry Lee died on June 19, 1794 at the age of 62. Lee is recognized as a Founding Father of the United States. Richard Henry Lee Elementary School in Rossmoor, California and Richard Henry Lee School in Chicago, Illinois are named in his honor. Richard Henry Lee Elementary in Glen Burnie, Maryland is also named after him. Late in 1941, a Liberty Ship was named for him. The Chantilly Archaeological Site was listed on the National Register of Historic Places in 1971. Lee is portrayed as a character in the musical 1776. He was portrayed by Ron Holgate in both the Broadway cast and in the 1972 film. In one scene, Lee performs a song called "The Lees of Old Virginia," in which he explains how he knows he will be able to convince the Virginia House of Burgesses to allow him to propose independence and celebrates his own status as a Lee, one of the First Families of Virginia. The character is presented as vain, but not very bright, serving the play as a comic device rather than a historically based portrayal of Lee. Lee is portrayed by Paul Fitzgerald in the HBO miniseries John Adams. Although Lee had returned to Virginia, and thus was not present to vote on the Resolution for Independence, the miniseries portrays him as being present and casting the vote for the Virginia delegation. The miniseries does show the fact that Lee always had his hand wrapped in black silk to hide the deformation caused by a hunting accident. ^ Washington, Lawrence; McKim, Randolph Harrison; Beale, George William (January 1, 1912). "Westmoreland County, Virginia: Parts I and II : a Short Chapter and Bright Day in Its History". Whittet & Shepperson, printers. Retrieved September 22, 2016 – via Google Books. ^ "President Richard Henry Lee to Samuel Adams, New York May 20. 1785". Retrieved 22 September 2016. Wikimedia Commons has media related to Richard Henry Lee. United States Congress. "Richard Henry Lee (id: L000201)". Biographical Directory of the United States Congress. Richard Henry Lee papers in the Manuscripts and Archives Division at The New York Public Library. Chisholm, Hugh, ed. (1911). "Lee, Richard Henry" . Encyclopædia Britannica (11th ed.). Cambridge University Press.